Minister Alain St.Ange, the Seychelles Minister responsible for Tourism and Culture and Mr Manoj Papa, the CEO of Air Seychelles jointly chaired a press conference at the Hilton Hotel in Durban South Africa to update thePress Community of South Africa on the State of Tourism of the Seychelles. Miss Seychelles 2013, Agnes Gerry and two Air Seychelles Cabin Crew were on hand to welcome the press to the conference that had been jointly organised by David Germain and Marsha Parcou o the Seychelles Tourism Board in South Africa and Josie Michaud-Payet and Cindy Vidot of Air Seychelles. David Germain the Seychelles Tourism Board Director for Africa & the Americas welcomed everyone to the press conference and it was Minister Alain St.Ange, the Seychelles Minister for Tourism and Culture who opened the press conference with an overview of the Seychelles tourism industry and the importance of South Africa as a tourism source market. The Minister also explained to the room packed with journalists the friendly ties that existed between Seychelles and South Africa. Minister St.Ange touched on South Africa KwaZulu Natal having been a joint co-host of the ;sat April Carnaval International de Victoria in Seychelles. “South Africa has been and remains an important target market for the Seychelles tourism industry. We welcome South Africans to our shores. You need no visa to land in Seychelles, a destination that is safe and where you will see many South African businesses are today well established in Seychelles. We are but some four hours away from South Africa and have for South African holiday makers the best in sun, sea and sand breaks, big game fishing, in sailing, in island hoping etc.. Ou arrival figures from South Africa has been growing steadily and we count on you, our friends in there press, to increase the visibility of our mid-ocean islands to the population of South Africa” said Minister Alain St.Ange. When he took the floor, Mr Manoj Papa, the CEO of Air Seychelles said today Air Seychelles and South African Airways were working in codeshare agreement. “We have made it easy fr South African to travel to Seychelles. We have turned our airline around from one suffering from serious financial difficulties but a couple of years ago to a profitable airline nowadays. We are consolidating our network and will be flying to Paris France soon. 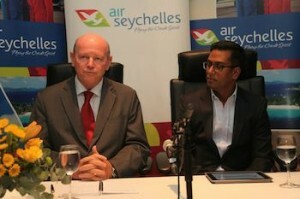 We are also rebooking at introducing new regional routes in the near future” said the CEO of Air Seychelles. A open session of question time followed where both Minister St.Ange and Mr Papa answered questions from the floor.